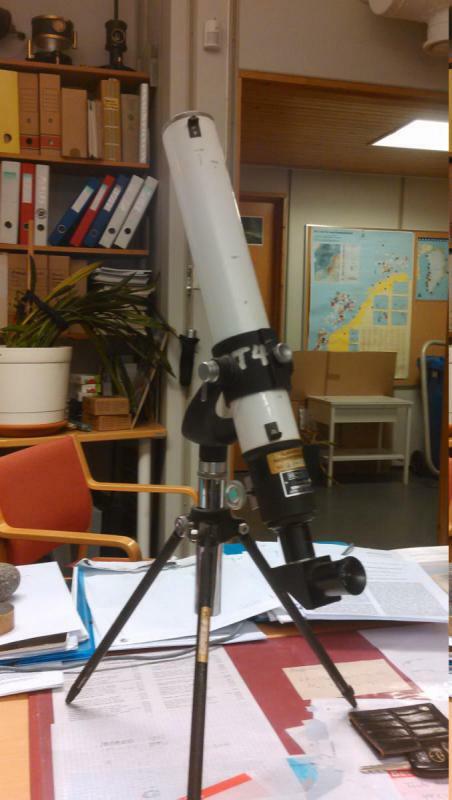 I found this little telescope where I work. 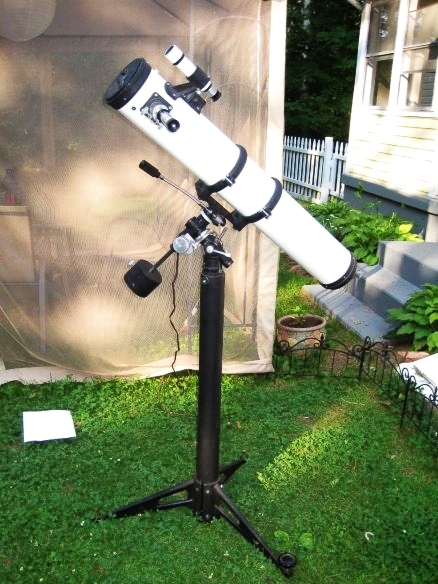 As you can see from the pictures it is a 500 mm table mount telescope from Royal Astro Opt. Tokyo. Unfortunately the objective is missing. 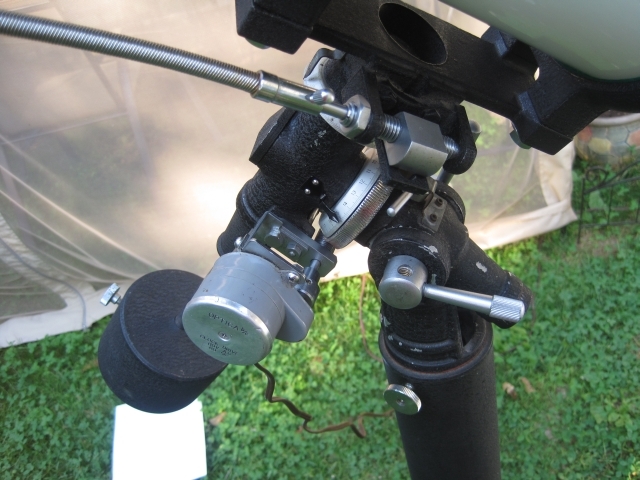 I am therefore wondering if there are anyone out there who happens to know if there exist some repository of spare parts where I could purchase the missing objective to make the telescope whole? You could search for twenty years and not find one, or you could find one tomorrow. Nice find! The 50 x 500 scopes seem to be rare compared to the 50 x 600 scopes. Like Chuck said, you'll never know when one might pop up. Could you post a photo of the label on the focuser, please? Too bad about the objective lens. There's always a few 50's turning up on ebay. Perhaps you can find another brand with a decent donor lens. Worst case, cut the tube and fit a good 50mm finder lens. Leave it to Royal. I've never seen a 50mm with such a substantial focuser. Looks like you might be able to fit it with a 1.25" visual back. This is the clone pf the Micronta and Bushnell 50mm f10. Good lens, and the Jason, though nicely made, is not anywhere userfriendly in original configuration. I doubt that cell would thread on, though. The objective itself from the Jason should fit, might need a spanner.I have an objective cell and 600mm sized tube if you need one, pm me, and I'll mail it to you. Edited by Vesper818, 06 March 2016 - 04:17 PM. Seeing the focuser on this scope and the one on the 50mm f/5 spotter that I use as a finder on the Tinsley is more evidence that mine is either a 1960s Royal, or a Towa with the same supplier. Does your focuser accept the Vixen 36.4mm to 1.25" adapter? The tube on mine is between the single tube units that will fit it, and the manual drawtube on some Royal & Towa long refractors, yet it has a helical-cut rack and slotted accessory holder. Haven't seen another like it except for maybe... Unitron. (Yeah, I said it.). Did Uni sell a heavy rugged spotter 50 odd years ago? It has a very good lens. At f/5 it has about the same CA as my Towa 50mm f/12. I don't think it's a Towa lens. It's a much higher quality tabletop scope than my Monolux 4348. IMO, it's well worth a restoration & rebuild. Who knows, you may like views so much that you put it on a GEM. I've had a blast with mine. If the skies cooperate, I'll use it for some Jupiter imaging tonight. 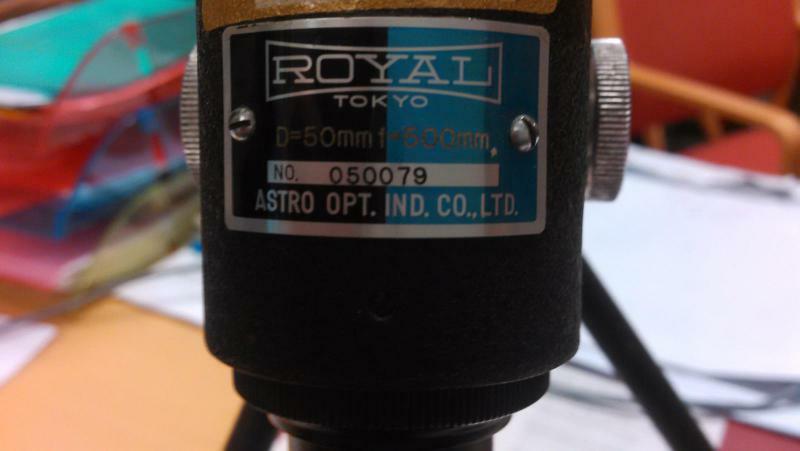 Your scope looks like the Royal Astro Optical model R-53 which is a 50mm x 500mm table top version of the R-51 which sported a tripod. 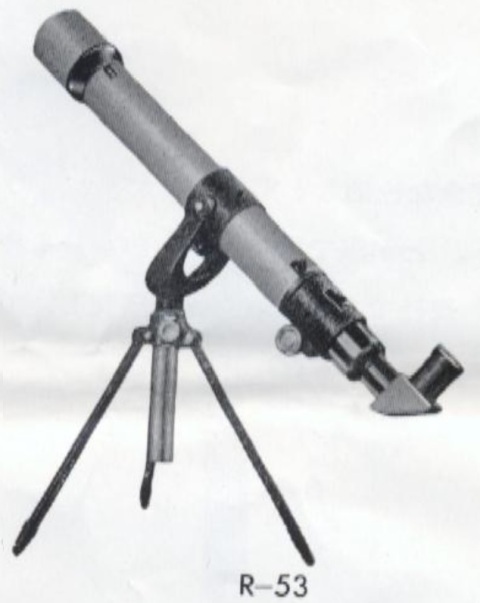 See photo of the R-53 from a 1964 Royal Catalog. I have the ATCO 55 X 50mm version of this RAO R-53 that I found on GW. 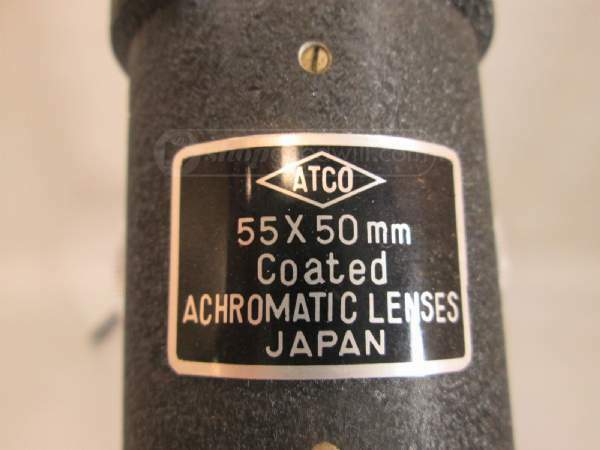 The 55 refers to the magnification with the supplied H.M. f=9mm eyepiece. See photos of that scope for reference. Here is a photo of the label. I have had one of your little Royal 50x500 mm for 50 years. It came in a lovely little wooden box which I also still have. 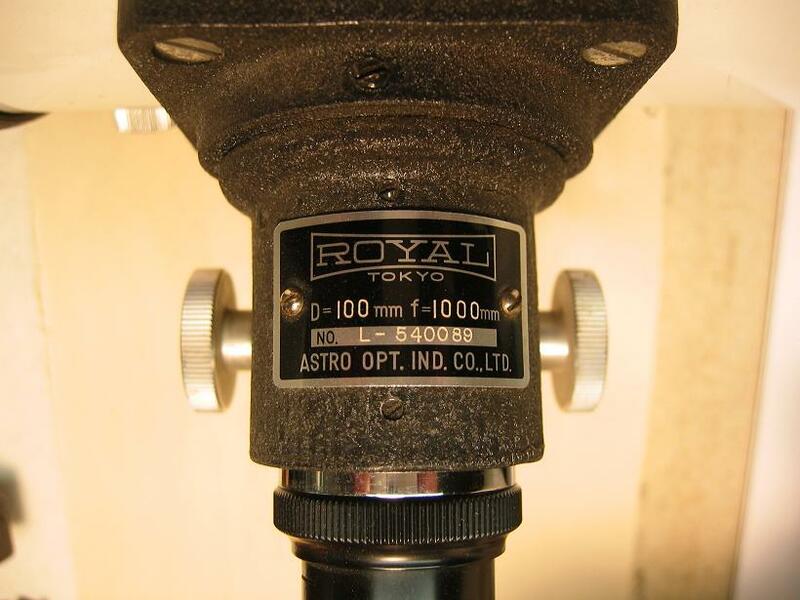 As a 12 year old member of the Royal Queenland Astronomical Club I was embarrassed that my 'scope was the smallest of all the older member's instruments. I was also mortified that it had the little peep sights that you still have on yours. I screwed them off and replaced them with a tiny finder 'scope so that it looked more professional! I wish I had kept the peeps. Despite quite a few OTA bumps and scrapes, the objective lens is still in first class order and displays a great set of Newton's Rings. Viewed objects are necessarily tiny but always sharp. The disc of Jupiter, the rings of Saturn, Omega Centauri and many wonderful clusters and double stars are very sharp in a good viewing atmosphere. However, any eyepiece shorter than 10mm is quite useless because of image dimness. All things considered, the instrument really does perform. Nevertheless, nostalgia is a powerful emotion and everytime I walk into the room where the little Royal sits on a cupboard shelf, I cannot help but smile, until that is, I see the three little holes where those peep sights used to be! PS. When I use the Royal I always detach it from the unstable little table top tripod and wack it onto a big stable platform. It makes a world of difference but it does look a bit strange on a DM6! Edited by IanT, 08 March 2016 - 06:21 AM. You would need a donor cell too. 50mm x 500 is an odd size. You could look at industrial optics and laser stuff on Ebay. Melles Griot and the like sell that size/ FL. The black/blue ID plate is interesting. I have seen all black, and all blue. Its tough determining the decade from the first number. I'm wondering about my L? or LN?-4E Newtonian also, 1965 or 1975? Edited by actionhac, 10 March 2016 - 09:43 PM. 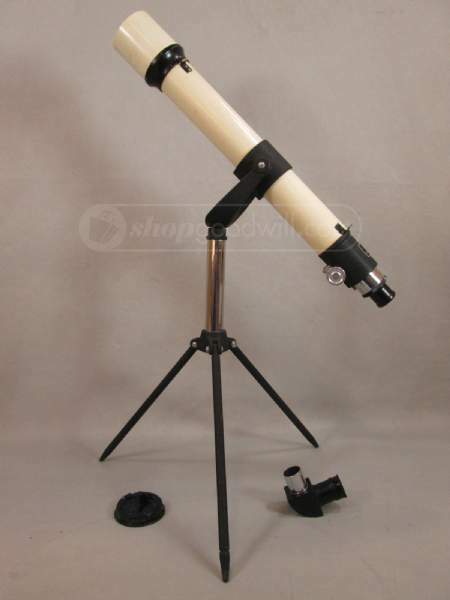 Galileo Scope kits are 50mm f11 objectives. I'm pretty sure 1960. I'm not sure RA serial numbered anything into the 1970s. Stargoat Stephen knows. Robert, have you posted photos of your LN-4E? How complete is it? original eyepiece that was in the focuser when I bought it. of my early pictures when my computer malfunctioned. Actually it was me that malfunctioned pushing the wrong button loosing all my stored pictures. remember posting any for the LN-4E. I'll take some pictures of it soon. Mine came with no case, but there might not have been one originally. This one used to belong to John Siple and the badge is missing, but he said it was an Optica b/c branded scope. You can find the scope in one of his articles from the Rosette Gazette, but I can't remember which one off the top of my head. The motor drive is also an Optica b/c, so I trust that the whole scope is, too. It has an original camera bracket that really throws the scope out of balance, but leave four holes if you remove it. It's a great scope and rather hard to find.